Murchison Falls National Park, part of the greater Murchison Falls Conservation Area (MFCA), offers excellent wildlife viewing. The MFCA includes Kaniyo Pabidi, which is a great place for chimpanzee tracking. Most big safari animals are easily seen, including four of the Big Five. The Victoria Nile bisects the park. At Murchison Falls, the Nile is channeled through a narrow cleft in the Rift Valley escarpment. 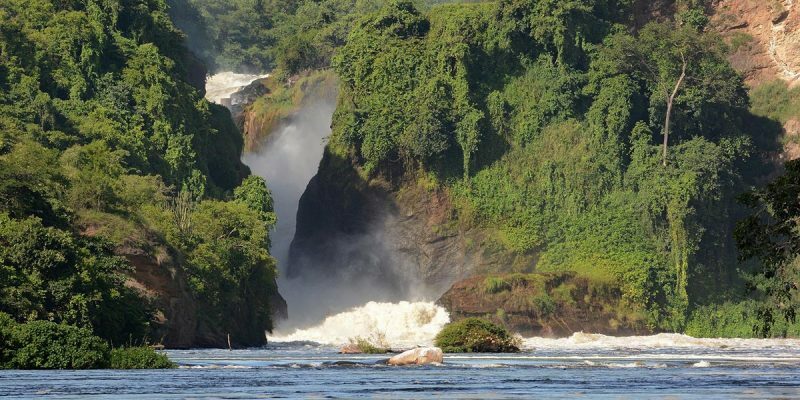 Boat trips to the spectacular Murchison Falls, perhaps the most impressive waterfall in East Africa, are a highlight – especially if you hike to the top where the immense power of the Falls is best appreciated. Interested in visiting Murchison Falls National Park? In 1951, the Falls provided a backdrop for Humphrey Bogart in John Huston’s famous movie, The African Queen which was filmed on location along the Murchison Nile and on Lake Albert. British royals have also visited Murchison, the Prince of Wales (later Edward VII) in 1930 and the Queen Mother in 1959. The least happy celebrity visitor was Ernest Hemingway in 1954 who literally dropped in. His intention was simply to overfly the waterfall but his plane clipped an old telegraph wire strung across the gorge and cart wheeled into the river line forest. Hemingway and his wife were rescued and taken to Butiaba where their rescue plane crashed on takeoff. The Murchison Falls National Park is bisected by the Victoria Nile which first races down 80km of white-water rapids before plunging 40m over the remnant rift valley wall at Murchison Falls, the centre piece of the park. This waterfall was named in 1864 by the explorer Samuel Baker who considered it ‘the most important object through the entire course of the river.’ The Falls drains the last of the river’s energy, transforming it into a broad, placid stream that flows quietly across the rift valley floor for 55km to Lake Albert. This stretch of river provides one of Uganda’s most memorable wildlife spectacles. Regular visitors include elephant, giraffe and buffalo while hippopotamus and Nile crocodile are permanent residents. The park covers 3,893km2 and is Uganda’s largest protected area. Today it is part of the even larger Murchison Falls Protected Area (5,072km2) which includes the adjoining Karuma and Bugungu wildlife reserves. The Albert Nile corridor is Uganda’s lowest area (612m at Delta Point) and temperatures can be hot with a mean maximum of 29OC. The hottest times are mid December to mid February and June-July, tempered by rainy seasons in April and November.